Mix flour, 1/3 cup cornmeal, 1/3 cup sugar and 1/2 tsp salt in food processor. Add butter and pulse until mixture resemble coarse crumbs. Sprinkle in 4-5 tbsp ice water, 1 tbsp at a time, mixing lightly with hand until dough comes together (dough will feel very dry at first). Shape into a ball. Sprinkle large cookie sheet with remaining 1 tbsp cornmeal. Place dampened towel under cookie sheet to prevent it from slipping while rolling dough. With floured rolling pin, roll dough on cookie sheet into a 13-inch round. With long metal spatula, gently loosen dough from cookie sheet. In large bowl, mix 1/3 cup sugar with cornstarch. Sprinkle half of sugar mixture over centre of dough, leaving a 2 1/2 inch border all around. add cherries to sugar mixture remaining in bowl; toss well. 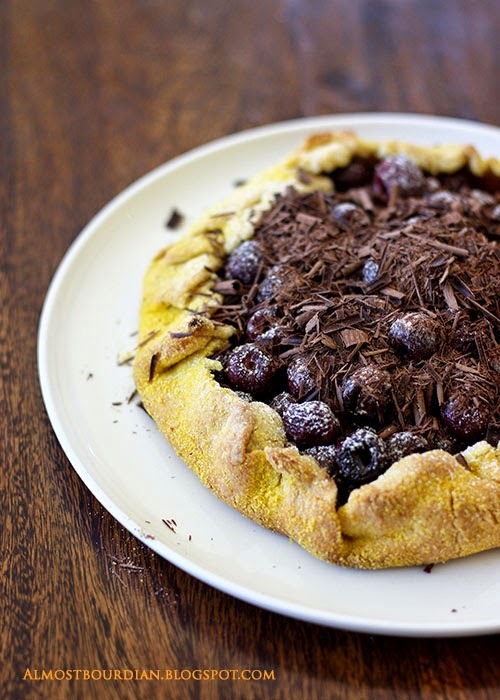 Spoon cherry mixture over sugar on dough round. Fold dough up around cherries, leaving a 4-inch opening in center. Pinch to seal any cracks. In cups, mix egg white and 1/8 tsp salt, Brush over dough; sprinkle with remaining 1 tsp sugar. Refrigerate 30 minutes, or until well chilled. Preheat oven to 425F (220C). Place 2 sheets of foil under cookie sheet; crimp foil edges to form a rim to catch any drips during baking. 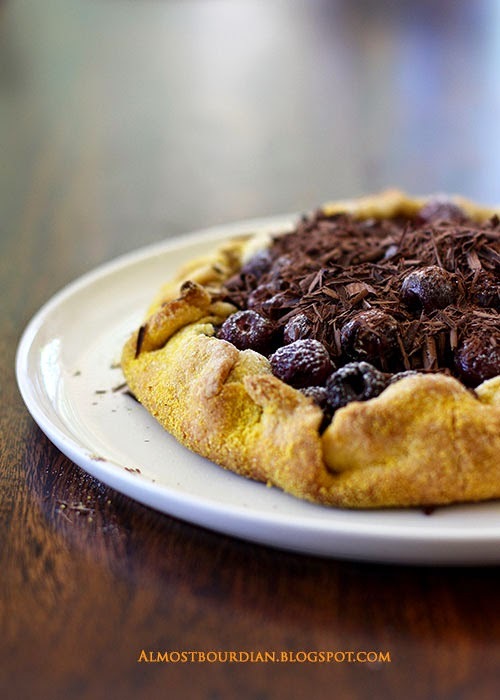 Bake tart 45-50 minutes, until crust is golden and filling is gently bubbling. Covering loosely with foil during last 10 minutes to prevent overbrowning. As soon as tart is done, with long metal spatula, loosen tart from cookie sheet. Cool tart 15 minutes on cookie sheet, then slide onto wire rack to cool completely. Dust with icing sugar and sprinkle with shaved dark chocolate.